Using latest revision (#21132) on Fedora 10, one of the selection arrows is not being drawn under some specific conditions. See the attached screenshot. 2) The arrow is initially drawn, but disappears when switching from scaling/translating mode to rotating mode of the selector tool, or back again. 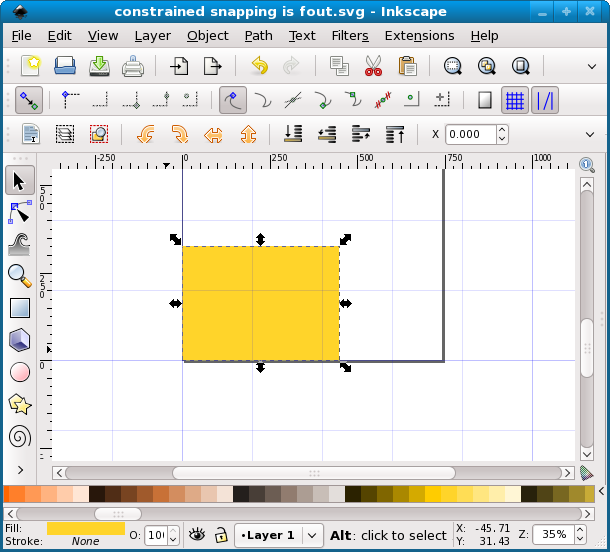 Not reproduced with Windows VIsta, Inkscape build 21115. Confirmed with Ubuntu 8.10, build 21132. But the steps are different. It works well if Stroke Paint is set to "no paint", and fails if set to "Flat", with "Width" set to 0. With 21139, it fails with "no paint" too. Worked well in 0.46. Tagged as regression. I can't reproduce it on Ubuntu 9.04, Inkscape r21932. Could you test and confirm the bug is gone? I cannot reproduce this any longer with the fix applied in rev. #10463, so I guess this has been fixed!